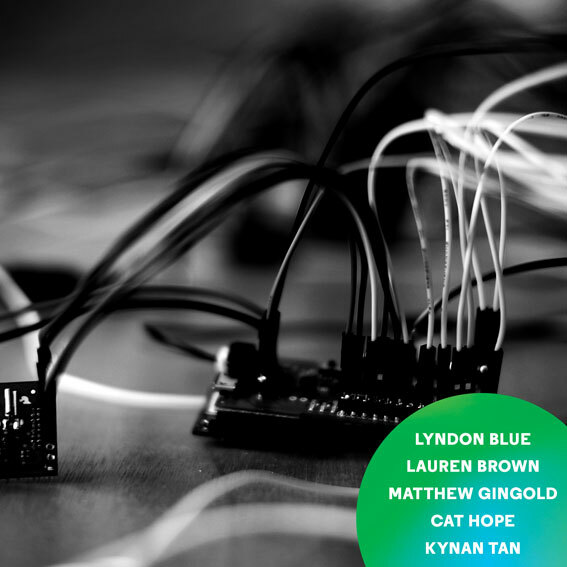 What I See When I Look at Sound is an exhibition of sound that launches new pieces by five outstanding Australian artists. Each artist has designed a work for extended play within PICA’s galleries, speculating on what it means to visualise and encounter sound art today. The works are each systems unto themselves, often manipulating the creative process of improvisation while relying on graphic notations, code, algorithms and applications to generate or imagine new compositions. Matthew Gingold has created an extraordinary self-playing orchestra in which the instruments are light bulbs, radios and relays, creating a symphony of signals, shadows and electronic chatter. Cat Hope’s sound sculpture of seven bass guitars and amps is a reverb tower of feedback which stands in dialogue with Lauren Brown’s silent catalogue of sounds meditating on the way we listen to, see, transcribe and share sound. Kynan Tan’s double projection and multi-screen work creates isolated and controlled sonic and visual chambers, a counterpoint to Lyndon Blue’s interactive installation is a strange mystical and malleable music video in which found film footage and a soundtrack composed by the artist is manipulated by visitors via a theremin. What I See When I Look at Sound is a response to the rise of sound art practices and international sound art shows in galleries, and the need to create a platform with a focus for Australian artists who are working dynamically across thresholds of music, sound and visual art. PICA has long been engaged with experimental music and interdisciplinary practices and is always seeking to create exciting and defining moments for artforms, artists and to connect audiences directly with these. The exhibition was also informed by phonograph, an exhibition at ddd gallery in Osaka in 2011, curated by artist and musicologist Yukio Fujimoto and his comment that “people today hear sounds with their eyes and see pictures with their ears”. What I See When I Look at Sound deliberately confuses those registers and invites a selection of Australia’s most interesting and experimental artists and musicians to both visualise and sonorise this idea. The exhibition title is inspired by What I Talk About When I Talk About Running by Haruki Murakami, itself a play on Raymond Carver’s collection of short stories What We Talk About When We Talk About Love. Both are very human responses, memoirs of sorts of about personal experiences of running and romance. Deliberately playing with the logic and singular focus of these popular books, What I See When I Look at Sound asks artists and visitors to the show to really question the relationship between looking and hearing; between our eyes and ears and the interplay of our senses in how we make sense of the world today. This exhibition unites radically different manifestations and improvisations on the theme of seeing and shaping sound. The works in the exhibition are synaesthetic offerings for our senses, profoundly shifting the registers that we usually associate with sound.